Of course, people are still going to believe that the banks had something to do with it, but it takes TWO TO TANGO. We have to remember; there has to be someone buying up palladium to push its price to new highs. When its positive financial results came out, MDB’s revenues jumped by 72%, from $154 million in 2017 to $267 million last year (the company’s year takes place at the end of January). However, while the revenue increase was excellent, the company still lost gobs of money. While MBD racked up more revenues, unfortunately, they also suffered a net income loss of $98 million. For some odd reason, traders and investors focus on the increased revenue but they tend to ignore the company has lost money for the past five years. Yes, they say that in time, they will become profitable, but come one… is a company that is losing nearly $100 million worth $155 a share?? 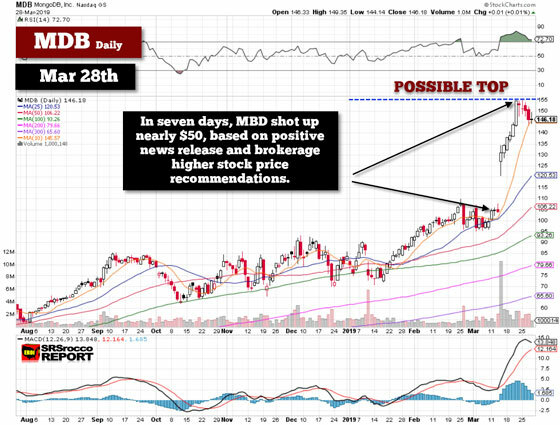 MDB’s stock gapped up from $106 to $155 in just seven trading days. Thus, it took one hell of a bunch of motivated “Traders Gone Wild” to push the stock to a record high. Of course, some buyers could have been funds looking to add another HIGH TECH WINNER to their portfolio, but a lot of the price momentum was also due to traders. You will notice the day MBD’s stock price gapped up and traded by more than $30, was on March 14th, the day the three new BUY recommendations came out. So, with the word out by the WISE BROKERS, the sheep traders and funds stepped in and pushed MDB’s price up to new highs. Let me tell you, I have looked at this company and maybe it provides some top-notch software service, but you don’t push a stock price up $50 on the PROMISE OF PROFITS in the future. This is what the market has become. … Momentum Trading Gone Wild. So, if you think this is only taking place in stocks, think again. Ironically, I watched a Kitco interview on Tuesday here: Palladium and Rhodium Have More Headroom Left – Peter Hug, right before the price crashed $205. Peter Hug goes on to say that Palladium has more room to run, but investors should realize there are $50-$70 corrections. I can assure you; Peter Hug had no idea that palladium would fall $205 in three days. Now, I am not blaming Peter as I was stupid enough to make price predictions some years ago… no longer. However, I have been warning that palladium was getting over-heated for a while. Sure, the price did continue higher like the lousy MDB stock shown above, but at some point, investors stop buying. On Thursday, March 21st, not one person in the world would pay any more than $1,576.90 for palladium. That was the day palladium peaked. Unfortunately, that poor slob who purchased palladium at that price had no idea that he or she was the last BULL in the world… for that price trend. 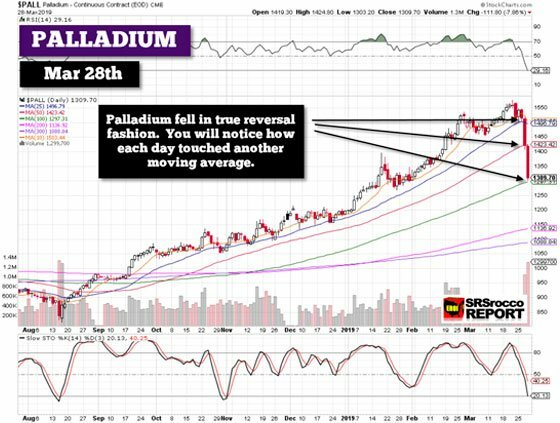 While palladium corrected up and down over the next three days, the real carnage took place on Wednesday and Thursday when the price fell more than $200. Secondly, if you look at those two daily price declines, they both traded right at the moving averages… no coincidence. 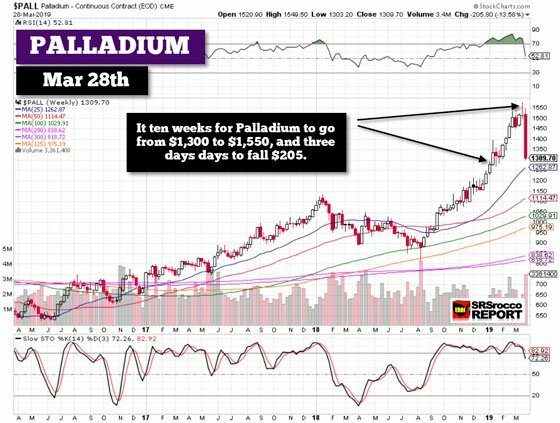 As I mentioned at the beginning of the article, it took palladium ten weeks to go from $1,300 to $1550 (closing prices) and only three days (really two) to fall $205. 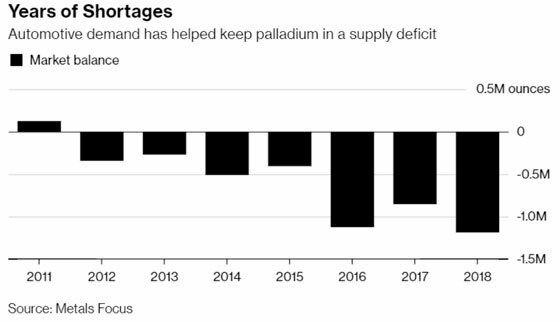 Furthermore, one of the most significant deficits took place in 2016, but the palladium price only increased $100 that year (started at $560 and ended at $660). That doesn’t seem like much of a price increase for such a large annual deficit. Yes, it’s true that the annual deficits have been higher the past three years, but do investors realize as of the end of 2017 (best data I could find), there was still something like 9.6 million oz of palladium above ground stocks?? That data came from the GFMS World Platinum Group Survey 2018, page 25. Moreover, 25% of the annual palladium supply in 2017 came from autocatalyst recycling. That’s correct; they are recycling a great deal of palladium, nearly 2.2 million oz in 2017 (source GFMS). According to GFMS, autocatalyst recycling of palladium has increased from 1.1 million oz in 2009 to a forecasted 2.7 million oz in 2018. So, I wasn’t surprised to see palladium fall that much in just a few days. I have seen this sort of price action in many stocks. Of course, I wouldn’t be surprised if Banks or Brokerage Houses were putting out higher price targets for palladium while taking the other side as a short. This is the way the market works. It puts out the BUY RECOMMENDATION, and the SHEEP come for the slaughter. Lastly, I would imagine the palladium price will need to correct back higher after such a large selloff, but I wouldn’t be surprised to see lower prices in the future, especially if the global economy continues to weaken over the next few years.